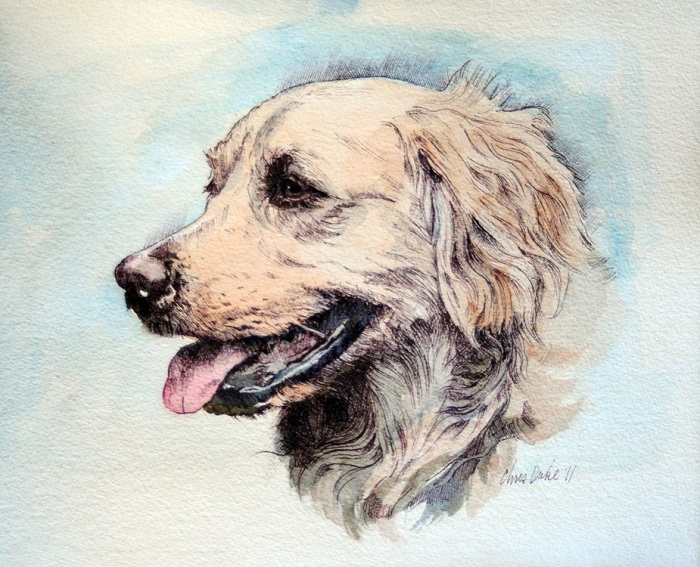 This is a portrait of a dearly beloved Golden Retriever who passed away, but who is adoringly remembered by the family when they view this art. There are many fabulous Alex stories. My favorite is the intelligence testing that this faithful and steadfast pup would be compelled to undergo publicly, often for company. The family would put a biscuit under a towel so poor Alex could smell and covet the biscuit, but not access it. Drama: would this Best of Dogs know enough to lift the towel to get his treat? It was a longstanding cliffhanger until one of the kids couldn’t resist and taught Alex to outsmart the sneaky towel tricksters.